Brick making in clamps is one of the oldest technologies in the world, as also in India. A clamp is the most basic type of a brick kiln. It essentially consists of piles of green bricks interspersed with combustible material. No permanent structure is required, which lowers the initial infrastructural cost and does away with any maintenance cost. The technology used in the making of a clamp and to fire bricks inside it is simple and easily replicable. Clamps are, therefore, an attractive financial and technological option for making bricks. 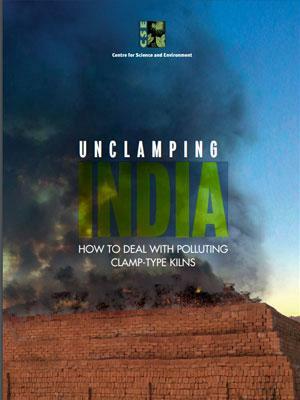 However, clamps employ one of the least efficient and most polluting brickmaking technologies. Zigzag kilns produce about 85 per cent good quality bricks; in comparison clamps only produce 50 per cent good quality bricks. The architecture of a clamp does not allow very efficient use of fuel, resulting in higher emissions from incomplete combustion. Specific energy consumption of clamps is almost double (2.10 mJ/kg fired bricks) that of zigzag kilns (1.10 mJ/ kg fired bricks). Moreover, clamps do not have emission dispersal mechanisms like stacks; therefore, the emissions stay at the surface level. This becomes a serious nuisance if the clamp site is near a residential area or an environmentally sensitive zone like a water body or major road. It also increases the health risks for the brick-making labourers.